Tonight's guest review is from a long time reader, first time reviewer, Luke! He's 21 years old, and recently married. He lives in Minneapolis. 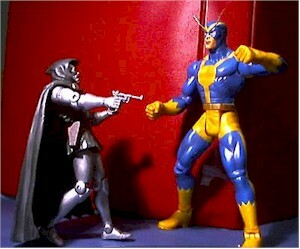 He collects many different lines of action figures, and likes making custom figures too. Check out his website for more info - take it away, Luke! A new Wal-Mart recently opened by my house. I don't think the scalpers know about it yet, because no one is ever waiting around for the store to open. I always have good luck there, and this week I found Goliath from Marvel Legends series 4. Goliath is quite rare, numbering only one per several cases. The clamshell packaging always has had its merits and faults. Toybiz has done an excellent job with this packaging option. 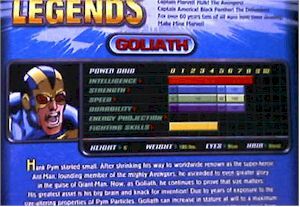 Both Goliath’s name and the name of the series are prominently displayed on the front of the package. The comic that is included with the figure serves as the background of the front of the card. As usual, Toybiz chose a colorful, dramatic comic that will catch your eye as you walk down the toy aisle. This one is Avengers #28, featuring The Return of Giant Man. Goliath, Ant-Man, and Wasp are nicely displayed on the card. The back of the card got a nice upgrade with this series. The overall theme of the line is described on top, followed by the new “Power Grid” which rates the figure’s strength, speed, and so on. Below that is a long description of the character himself. It’s nice to see so much information about the characters, especially for collectors who aren’t familiar with them. The only reason the package did not get four stars is that it is hard as heck to open! I like to be able to tear open the package like a wild animal as soon as I get out of the store and into the car. But you almost need a utility knife to cut through the hard plastic shell of the package. My teeth didn’t work out too well, and my car keys barely made a dent in it. Goliath is a repaint of Giant-Man from the Avengers line-up from a few years ago. He has a nice, solid sculpt. He is very large. This is my favorite thing about him. He towers over all the other figures, including Hulk and Thor, by at least an inch, usually two or three. I think his facial sculpt could have been better. His face seems a little bit too flat. Also, around his eyes, his mask seems to blend in with his face. You don’t get a feeling that he is wearing his mask, like you do get with the Captain America figure. The paint is pretty simple on this one. He is 90% yellow and blue. Toybiz did put a wash on the blue to accent his muscles more. The paint is also a little bit sparkly, and shines much more than the other Marvel Legends figures. I’m not sure why this is, but I don’t think Goliath should be shinier than Iron Man. The yellow lines are mostly crisp and clean, with a few tiny errors. Overall, he is nothing special in the paint department. I didn’t expect much articulation from Goliath since he is the chase figure. But he does have more articulation than I expected. He has neck, ball-jointed shoulders, elbows, hips, knees, and ankles for a grand total of 11 points. The ball-jointed shoulders saved him from getting a lower score. I miss the cut wrist and ball-jointed hips like other Marvel Legends figures have. 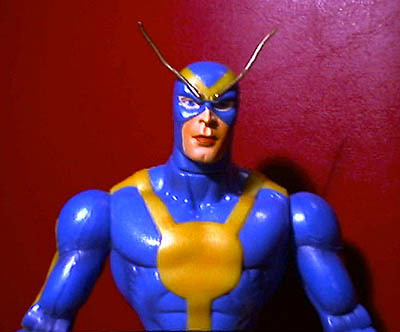 Goliath comes with the aforementioned comic, as well as Ant-Man and Wasp figures. These two extra figures are some of the coolest accessories we have seen thus far from Toybiz! If I were reviewing them as separate figures, they would both get four stars for sculpt and paint. They look spectacular and the paint job is perfect for such small figures. 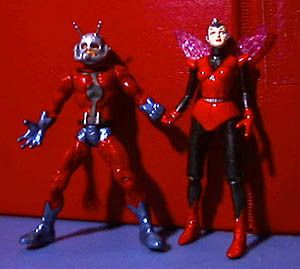 Ant-Man and Wasp are both about 2 ¼ inches tall and feature articulation at the neck, shoulders, hips, and knees. The only thing I feel is missing is a base of some kind. All other Marvel Legends figures (with the exception of the Wal-Mart variants) have had a base. I understand that Goliath is a chase figure, but even a repainted base form another figure would have been nice. This figure is worth every penny of the $5.99 I paid for him at Wal-Mart. Not only is he rare, but he is a cool figure! 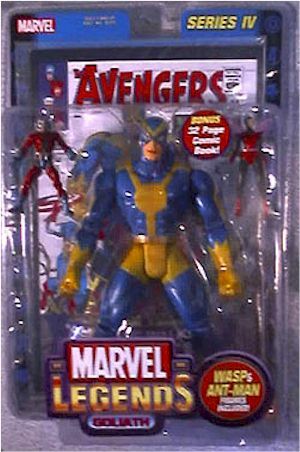 He is part of the original Avengers, and he comes with two bonus figures! 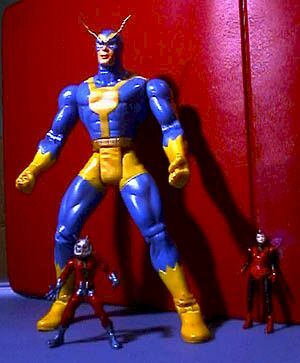 If you can find him, Goliath is a nice addition to the Marvel Legends roster, as well as Ant-Man and Wasp. The main things hurting the score were the lack of a base and the sculpt. I think the paint job would have naturally improved with a different sculpt. Here lies the problem. Like I said before, he only appears one per several cases of figures. I have been searching for him for months, along with many other collectors. He is out there. Collectors are reporting findings at Wal-Mart, Target, Toys R Us, and many other stores. On Ebay, he fetches between $50 and $70 on average. 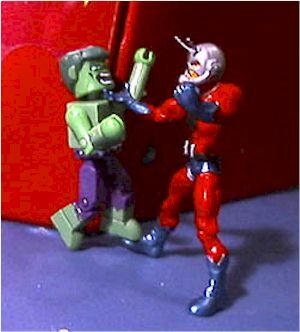 I would not pay that much money for this figure, but it might be worth it for some serious Avengers fans. I think the best place to find him right now is at Wal-Marts, because they just started getting Marvel Legends figures in. Before, only The Wal-Mart Supercenters carried them. At my Wal-Mart the pegs were up for the figures a week before the figures were even stocked. So I knew they were coming, and I checked every day until they were there. Figures from the collection of Luke.